The SEASOFT ULTRA DIVE Super Mask™ is our top of the line frameless single lens SUPER Mask with HGG GLASS™ and a CRYSTAL ARC™ lens that provides a diver with the fit, comfort and clarity that is unsurpassed. The HGG Glass™ is a special type of glass that has most of the impurities extracted from it and the CRYSTAL ARC™ coatings are ultra-thin metal oxide coatings similar those found on expensive riflescopes and camera lenses that allow more light to reach your eyes. Because more light reaches your eyes, more of the image does too. The amazing FITZ™ full liquid crystal silicone design, with a flarable skirt, delivers an unsurpassed comfortable, watertight fit for the medium to x-large face. Most divers will think the SEASOFT ULTRA DIVE Mask™ was designed for them! • Your choice of SEASOFT's Neoprene Clamshell Mask Strap or the SEA-DIAL™ ratcheting mask strap. • SEASOFT's LIFETIME BREAKAGE WARRANTY, never worry about a broken mask again. *Mask Strap - You must pick one! 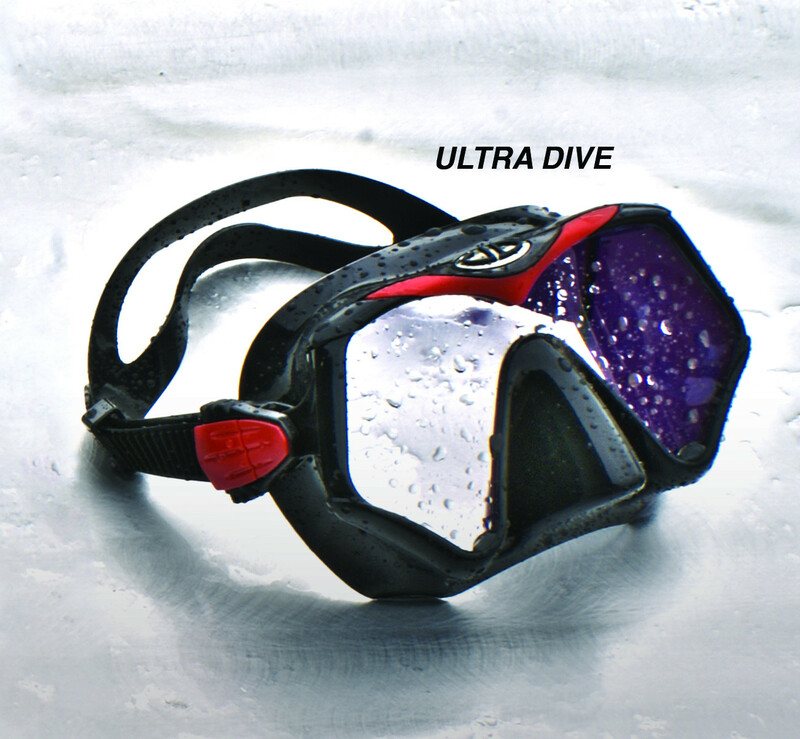 The SEASOFT ULTRA DIVE Super Mask™ is our top of the line single lens SUPER Mask. This frameless mask features a Crystal ARC™ and HGG Glass™ lens with 98% light transmission providing approximately 20% more clarity than most other masks. The multiple metallic oxide coatings on the lens, similar to those found on riflescopes and camera lenses, virtually eliminates glare and the resulting view is astonishing. What are HGG Glass™ and Crystal ARC™ lenses? All of SEASOFT's Super Masks have HGG Glass and Crystal ARC™ lenses for unsurpassed vision, especially in low viz situations. HGG Glass™ is a type of glass which has been treated to remove more of the impurities, specifically iron. Iron gives glass its "green" tint. SEASOFT uses a glass made from sand from North Africa known for its low iron content. When you eliminate the impurities, you reduce the reflective properties of the glass which improves it ability to transport light to your eyes. Cystal ARC™ coatings stands for Anti-Reflective Coatings, these multiple microscopically thin layers of metal oxides reduce the light that is reflected away from the diving lens. This is important because what we see is carried by that light. So the less light entering the mask, the less we are seeing, especially in low light, night diving, and in low viz dives. In a normal dive mask with "float" glass and without Crystal ARC lenses, approximately 84% of the light is reaching the divers eyes. In a SEASOFT Super Mask, approximately 98% of the light is reaching your eyes! We think that you will notice that kind of difference! It is like being in a dimly lit room and someone turns on a light. For divers who dive with limited visibility, the SEASOFT ULTRA DIVE Super Mask™ will give you not only the most visual clarity but also a larger field of view and the best vision possible in the most adverse conditions.